8th lunar month of 1699: first recorded stage appearance; he played at the Yamamuraza the role of the koshô Motome in the drama "Nagoya Sanza". 11th lunar month of 1700: Isogorô played at the Yamamuraza the role of Matsugae Miyakonosuke in the kaomise drama "Yorimasa Mannen Goyomi". 3rd lunar month of 1701: Isogorô's rank in the Edo hyôbanki, wakashugata section, was naka (middle class). 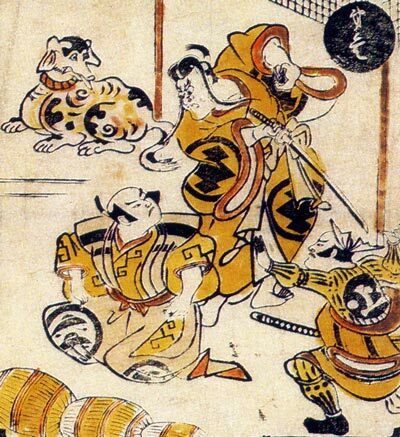 Beginning of 1707: Isogorô became tachiyaku at the Moritaza. 3rd lunar month of 1707: Isogorô's rank in the Edo hyôbanki, tachiyaku section, was naka-no-jô-jô (superior - superior in the middle class). 11th lunar month of 1707: Isogorô played at the Nakamuraza the role of Prince Tsubasa in the kaomise drama "Suô no Naishi Azuma Nishiki", which welcomed in Edo the actor Arashi Kiyosaburô I. 1st lunar month of 1708: Isogorô's rank in the Edo hyôbanki, tachiyaku section, was jô (superior) [visual]. Isogorô played in the same theater the role of Inubômaru in the new year sogamono drama "Keisei Arashi Soga"
2nd lunar month of 1708: Isogorô's rank in the Edo hyôbanki, tachiyaku section, fell back to naka-no-jô-jô (superior - superior in the middle class). 11th lunar month of 1708: Isogorô performed at the Nakamuraza in the kaomise drama "Miyasundokoro Monomiguruma". 3rd lunar month of 1709: Isogorô's rank in the Edo hyôbanki, tachiyaku section, was jô-(shiro)jô (superior - (white) superior) [visual]. He shared the same rank with Murayama Jûheiji I, Katsuyama Matagorô, Sakurayama Shirosaburô I and Narukawa Genzaemon. 11th lunar month of 1709: Isogorô played at the Nakamuraza the role of Imagawa Suruga-no-Kami  in the kaomise drama "Imagawajô Ryôshun Katoku". 3rd lunar month of 1710: Isogorô's rank in the Edo hyôbanki, tachiyaku section, fell back to jô (superior) [visual]. 11th lunar month of 1710: Isogorô became jitsuaku and performed at the Nakamuraza in the kaomise drama "Shinsen Kazanin". 3rd lunar month of 1711: Isogorô's rank in the Edo hyôbanki, jitsuaku section, was jô-(shiro)jô (superior - (white) superior) [visual]. 11th lunar month of 1711: Isogorô performed at the Nakamuraza in the kaomise drama "Mitsu Uroko Katoku Biraki". 3rd lunar month of 1712: Isogorô's rank in the Edo hyôbanki, jitsuaku section, was jô-jô (superior - superior) [visual]. 1st lunar month of 1713: Isogorô performed at the Nakamuraza in the new year sogamono drama "Ôkazari Kanô Soga". 11th lunar month of 1713: Isogorô performed at the Moritaza in the kaomise drama "Yorimasa Taikyoku no Mato"; his stage partners were Nakajima Kanzaemon I, Murayama Heiemon III, Katsuyama Matagorô, Kuwabara Sanzaemon, Iwai Sagenta I, Nakajima Kanroku I, Sodesaki Nuinosuke, Fujita Hananojô, Ônishi Moriemon, Saigoku Hyôsaburô, Tsutsui Utanosuke, Uemura Kohachirô and Nakamura Kichibê I. 11th lunar month of 1714: Isogorô played at the Moritaza the role of Abe no Munetô in the kaomise drama "Onna Ryûko Futatsu Gashira". 1st lunar month of 1715: Isogorô's rank in the Edo hyôbanki, jitsuaku section, was jô-jô-(shiro)kichi (superior - superior - (white) excellent) [visual]. 11th lunar month of 1715: Isogorô played at the Moritaza the role of Kanawa no Ôji in Mitsushima Shichirôzaemon's drama "Hayazaki Onna Shimabara". 1st lunar month of 1716: Isogorô's rank in the Edo hyôbanki, jitsuaku section, was jô-jô-(hanshiro)kichi (superior - superior - almost excellent) [visual]. 2nd lunar month of 1716: Isogorô appeared on stage for the last time, playing at the Moritaza the role of Kudô Saemon Suketsune in the new year sogamono drama "Wakayagi Shiai Soga"; his stage partners were Sengoku Hikosuke I (Wada no Yoshimori), Katsuyama Matagorô (Jûrô's retainer Oniô Shinzaemon, later Soga Jûrô Sukenari), Ichikawa Danzô I (Gorô's retainer Danzaburô, later Soga Gorô Tokimune), Tomizawa Hanzaburô I (Kobayashi no Asahina), Fujimura Handayû II (Gorô's lover, the courtesan Kewaizaka no Shôshô), Tamazawa Rin'ya (Jûrô's lover, the courtesan Ôiso no Tora), Sodeoka Shôtarô (Kawazu Hakoômaru, later Gorô's retainer Danzaburô), Matsumoto Shirogorô (Matano Gorô) and Ichikawa Montarô (Kawazu Ichimanmaru, later Jûrô's retainer Oniô Shinzaemon). 4th lunar month of 1716: Isogorô's rank in the Edo hyôbanki, jitsuaku section, was jô-jô-(hanshiro)kichi (superior - superior - almost excellent) [visual]. 13th day of the 6th lunar month of 1716 : Isogorô died in Edo . Hamazaki Isogorô was an Edo actor, who was active from the end of the 1690s to the second half of the 1710s. He was successively wakashugata (1699~1707), tachiyaku (1707~1710) and finally jitsuaku (1710~1716). An interesting feature for this actor was the fact that he was a wakashugata when his was in his thirties, which was very unusual in the Kabuki world. It is also worthy to note that he never performed at the Ichimuraza. The 13th day of the 6th lunar month of the 6th year of the Shôtoku era was the 31st of July 1716 in the western calendar. Recorded as performing as a wakashugata in the 11th lunar month of 1701 at the Yamamuraza. Recorded as performing as a wakashugata at the beginning of 1703 at the Moritaza. Recorded as performing at the beginning of 1706 at the Moritaza. Imagawa the kami of the Province of Suruga. His tombstone was located in the Myôenji Temple in the district of Yanaka. According to another record, it was the Jôshinji Temple in Asakusa.